Dear Mount Laurel: Excellent insanity, refreshing your page 119 in less than 10 minutes. That was some OCD there, friend. You have until Monday at 9 am to contact us ( munger @ duke dot edu ), and supply the last two (hidden above) portions of your IP address. If you do, you will receive the ####-Grier and Munger-Munger books, at an address that you specify. Congratulations! And thanks to everyone for playing. A piece at the Freeman, on my visit to Cuba nearly 15 years ago. Not really a happy story. This is so great, people. Apparently Kevinismus is a rare German illness than manifests in parents giving their kids weird "american" names like Kevin (by the way it's Irish which infuriated my Scottish grandfather to no end). "At some point in the last couple of decades, parents in Germany started coming down with Kevinismus— a strange propensity to give their kids wholly un-German, American-sounding names like Justin, Mandy, Dennis, Cindy, and Kevin. Kids with these names tend to be less successful and have more behavior problems in school. Studies of the Kevinismus phenomenon attribute these effects to a combination of teachers’ prejudices toward the names, and the lower social status of parents who choose names like Kevin." Hat tip to the one and only Mrs. Angus! As Angus noted, we approach the 2 million visitor level. You can follow progress down toward the middle-right of the page, on the red "SiteMeter." That number will be the official number, and we will identify # 2 million soon! That's the powerful Bill Evers holding the book over his head, in triumph. So the spending cuts have "cost a lot of jobs", but there's been 6.1 million new jobs total under Obama (6.7-.6) versus 4.3 million under Bush (3.1+1.2)? That's around 42% more total jobs (1.8 / 4.3) from Obama than Bush, but spending cuts have "cost a lot of jobs"? 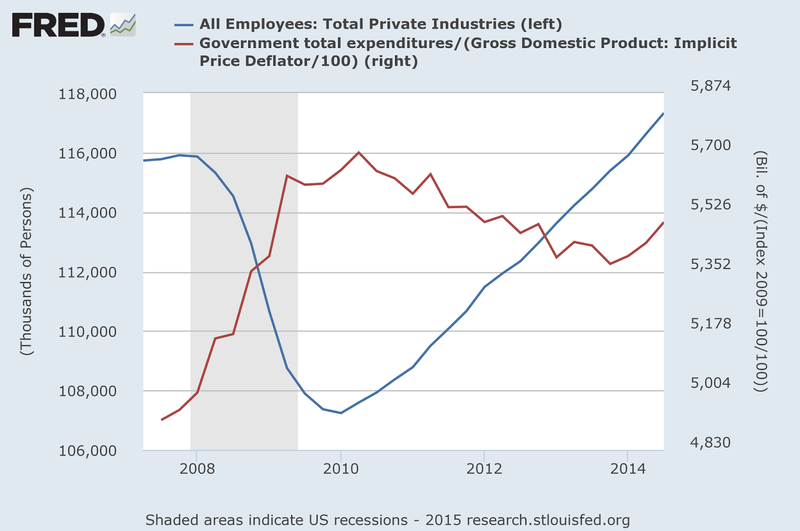 Does PK think that if public sector jobs had been 1.8 million higher than actual under Obama that private sector job growth would have been unchanged? From 2008 to the end of the sample, the correlation between the two series is -0.75! Now sure, the government could be reacting to the job movements by increasing spending when jobs are falling and then tapering off when jobs are increasing. That makes sense, it's called counter-cyclical policy and it's generally what we want. But PK is railing against the tapering of government spending (austerity) saying it "cost a lot of jobs", even though, as he pointed out, job growth under Obama is quite a bit higher than under Bush (and lord knows Bush didn't cut spending) and that private jobs grew strongly during our era of austerity. Now one can always construct the convenient "counterfactual" that job losses would have been worse without the stimulus and job gains would have been stronger without austerity, but it requires some pretty difficult mental gymnastics. If $700 billion in stimulus over 9 quarters didn't notably stem job losses, how can $325 billion of austerity over 14 quarters notably hurt job growth? Or putting it the opposite way, if the small amount of austerity killed jobs, how could the much larger amount of stimulus not notably stem job losses? It's pretty tough to have it both ways, but PK is sure giving it his best shot. I can imagine Angus muttering "Goldarn kids!" 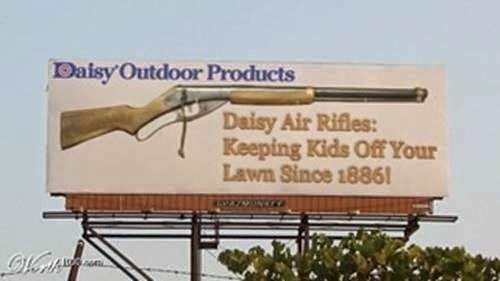 and aiming the Daisy through the upstairs window at the kids on the cul de sac. "They'd better not step on my nasturtiums!" Only in Norman, though. Not many kids around in Santa Fe. Spectacular KPC 2,000,000th visitor massacre! People, the sublime mess that is KPC keeps on chuggin'. Sail on o ship of state and all that. To partially thank our loyal, wonderful, (likely damaged) readers, we are going to give away two new Cambridge Press books to our awesome, divine, god-like two millionth visitor. We could "spread the wealth around" and mail a page to each of you but that just not how we roll. 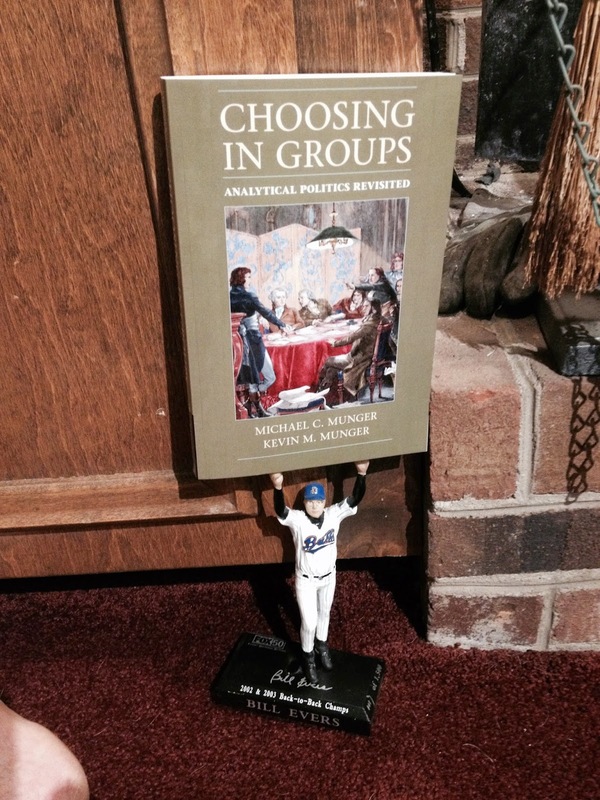 The first book is Munger's "Choosing in groups" (which is joint with the EYM. I wonder how many second year PhD students have CUP books out?). 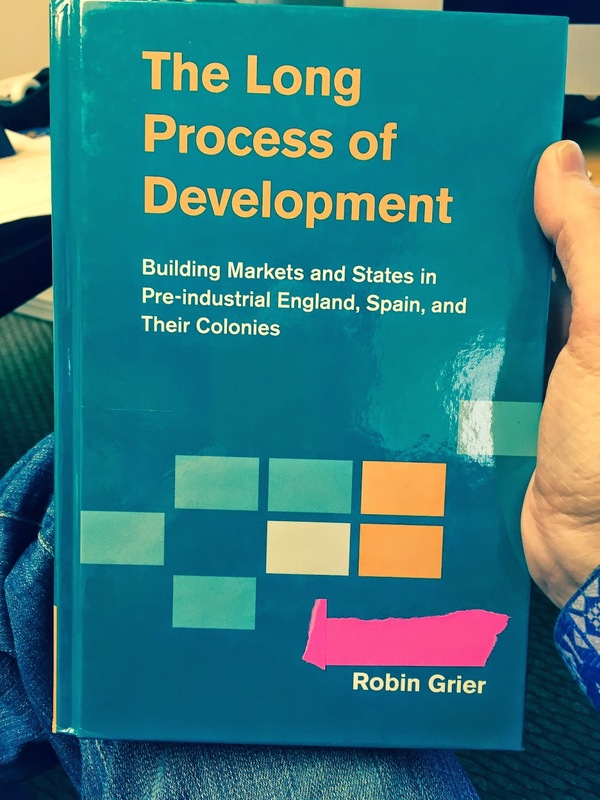 Since I can't write anything over 25 pages long and have no children, I've gotten Mrs. Angus to toss in a copy of her new Cambridge book, "The long process of Development"
Q: What's long and hard on a country? So keep visiting KPC for your chance at these faaaabulous prizes. I am not making this up. We will track our 2,000,000th unique visitor and upon contacting them and getting their info, will hit them with this awesome prize package. All decisions will be made by Mungowitz and are final. KPC employees and their families are ineligible. Thanks for tuning in and don't touch that dial. There's no pride anymore. I don't get any good "I'm a Nigerian prince!" spam any more. And even the phishing is as limp and worn out as...well, the band Phish. (Tofe, you know it's true). I got this: (click for an even more half-hearted image). So, this is supposed to be from The Google, from Gmail, right? And the idiot phisher can't even bother to get a free fake gmail account, even just as a "reply to" address? They have to send it from OUTLOOK? How lazy do you have to be to think, "Ah, spoofing a gmail account would take an extra 30 seconds..."
There's just no pride anymore.